The Mellowhood Foundation’s Summer Initiative is a paid summer program in the southwest Madison Meadowood neighborhood that teaches a large age-range of children about independence and real-world responsibilities. Many people hear about The Mellowhood Foundation from peers, relatives, and family. 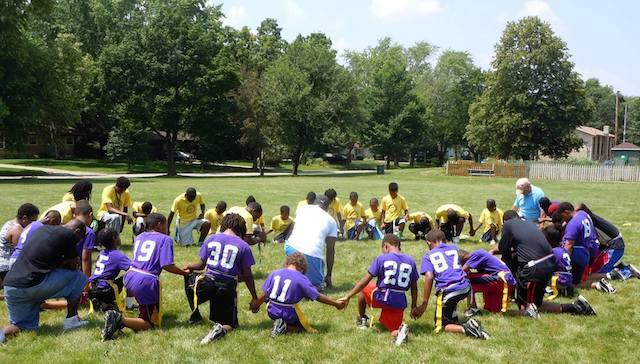 When students apply to become members of the Foundation, they must complete two home visits with Mellowhood coaches. At these visits, coaches meet with parents to make sure their children are interested and willing to contribute the necessary time and energy into the community. The close-knit Mellowhood community donates food from their gardens and provides an enriching summer program for local children. Students at The Mellowhood Foundation become part of an extensive community of people who are willing to support them and help them grow and learn about the environment. The Mellowhood students are split into two age groups – Juniors or Seniors. Juniors, generally children under 14, can start the program as early as the fourth grade; they work at a garden at Good Shepherd Lutheran Church. One way Juniors help is by growing milkweed for the garden’s butterflies. They also grow marigolds, petunias, squash, basil, and peppers in the garden, with the help of Master Gardener volunteers from UW-Extension and others. Seniors in the Mellowhood Foundation are made up of high school students. These students work in the Hammersley garden where they mainly grow watermelon and pumpkins, as well as a variety of fruits and vegetables. Seniors take on a lot more responsibility by working longer hours and planting and harvesting more. Seniors also run a podcast called Your Voice - Your Choice, in which they talk about their personal experience with the Foundation. The Mellowhood Foundation’s Summer Initiative was created to allow youth to take initiative in all aspects of their life. The work the students do at Good Shepherd Lutheran Church and elsewhere gives them a chance to learn about their community while helping to improve it. Through their work, students grow and continue their journey of becoming responsible, self-sufficient citizens. This story originally appeared in the Simpson Street Free Press. This article was written by Zaria Glover and Cris Cruz. Zaria Glover is a freshman at Madison West High School and has been working at Simpson Street for three years now. She's interested in pursuing a career in journalism. Cris Cruz is a Junior at Madison West High School and has been working at Simpson Street and Wright Free Press for six years now. He enjoys writing articles on space science and geography. The City of Madison’s Selfie Contest is well under way, but there’s still time to enter. As part of Madison’s Historic Preservation Plan, the city seeks the input of its citizens regarding the places that have shaped the cultural, social, and physical character of the city. Walking into Goodman South Madison Library on Saturday afternoon, visitors are greeted by two friendly staff members. “Are you here for the Real Life Library,” a staffer asks?